Toronto, Ontario (December 5, 2012) The Sunburst Award Committee is pleased to announce that the winner of its 2012 adult award is Paradise Tales by Geoff Ryman (Small Beer Press, ISBN - 9781931520645) and the winner of its 2012 young adult award is All Good Children by Catherine Austen (Orca Book Publishers ISBN - 9781554698240). About Paradise Tales, the Sunburst jury said: "Paradise Tales is a terrific collection of stories covering a dizzying range of imaginative possibilities and narrators. A superb stylist, the author fully adjusts the tone and rhetoric of each story to its narrator and its context. 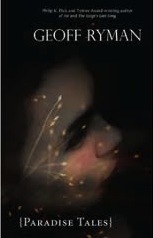 This masterful and eclectic collection includes looks at a truly post-human future in which intelligent animals carry the seeds of a new humanity but may not want to produce it, as well as stories featuring various suggestive biotech possibilities, to the pioneering filmmakers of Mars, and to tender ghost stories, such as the fantasy dreams of the first lover of Pol Pot’s daughter. The author puts wit and consummate style at the service of profoundly human philosophical extrapolations." 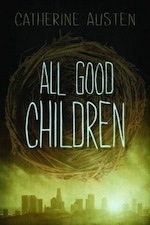 About All Good Children, the Sunburst Jury said: "In a physically and morally crumbling United States, 15-year-old Max Connors finds his family, friends, and himself under threat by a semi-covert Homeland Security plan to vaccinate all school children to be “good” – or, as Max calls it: zombification. Max, who’s smart, artistic, and a troublemaker, is horrified to learn that their parents and teachers are complicit and uses desperate measures to escape with his little sister and best friend. The author includes knowing nods to 1984, Brave New World, Stepford Wives, Alien and other pop-cultural touchstones in this tension-filled, fast-paced, and surprisingly tender dystopian thriller that’s narrated by its teen protagonist with wit and vigour." The jurors for the 2012 award were Douglas Barbour, Zsuzsi Gartner, Daniel Justice, Lorna Toolis and Halli Villegas. Geoff Ryman lives in the UK. This is his second Sunburst Award. He also won in 2005 for his novel Air. Catherine Austen lives in Gatineau, Quebec. The 2013 jurors will be Rebecca Bradley, Tony Burgess, Shari Lapeña, Barbara Roden, and Leon Rooke.